South Sudan's top rebel military commander Simon Gatwech Dual returned to Juba on Monday in a key step forward in a floundering peace process, calling for an end to war. "We are one South Sudan," rebel chief of staff Dual shouted, waving a walking stick in the air as he marched off the plane after landing in the capital, followed by over one hundred rebel troops. He was welcomed by top government army commanders, surrounded by heavily armed troops from both the government and rebels. "We are here to implement the peace agreement," Dual said, referring to a long-delayed and repeatedly broken August 2015 agreement. His return, flying on a specially chartered plane from neighbouring Ethiopia, is hoped to pave the way for the arrival of rebel chief Riek Machar, who fled Juba when the war broke out in December 2013. Machar is due to forge a unity government with his arch-rival, President Salva Kiir, returning to the post of vice-president he was sacked from months before the violence began. Dual was welcomed by the commander of the presidential guards, General Marial Chanuong. Both men have been sanctioned by both the UN and United States for their role in the more than two-year war in which tens of thousands have been killed. 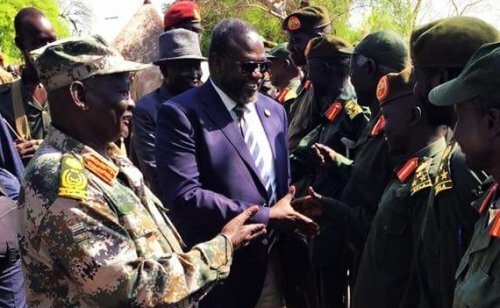 Rebel spokesperson William Ezekiel said that 195 troops landed along with Dual, to provide security for Machar, who he said hoped to return on Tuesday. Some of the rebel troops looked visibly nervous, but others were more cheerful and raised fists into the air as their leader shouted "Viva SPLA, viva SPLM!" - the acronym for the army and ruling party divided by the war. They came with their weapons, although they did not carry them off the aircraft, as they were offloaded from the luggage hold direct onto a military truck. Key international backers of the peace process are infuriated at his repeatedly delayed return, with the United States saying both sides have stalled the return of Machar. Rebels however insisted the return of the troops on Monday showed their commitment. "The arrival of the chief of staff means that the first vice president designate [Machar] can now follow," Ezekiel told AFP. "We are sorry for all the delays, but this is South Sudan and, well, the world's youngest country is still learning." The troops boarded three army buses, that would take them to one of three rebel army camps inside the capital.